2. You should have pan card. Step 1 : Understand the stock and its valuation. Study the fundamentals of the stocks and its valuation compared to its peers. For example, we have posted a detailed analysis of Mahanagar Gas Limited. You can get help from brokers and companies annual reports to understand the growth prospectus of the company. Also you can wait for the first day response of IPO and find out how investors are betting on the stock. Step 2 : Login to your online banking account. Here, as mentioned, we have taken SBI to provide the screenshots. Once logged-in, go to profile and click on Manage IPO Applicant. This will open up a form, where in you have to enter the details like Application name as in PAN card, PAN, Depository (You an get this from your broker, say for example zerodha's depository is CDSL), Beneficiary DP account number (You an get this from your broker, It is normally a combination of depository ID + Client ID) and Nick Name. In this way, you can add multiple accounts belonging to your wife, father etc. 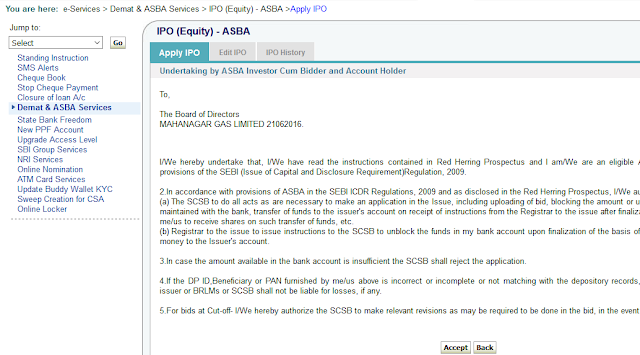 Step 3: Once added, go to e-Services tab and click on Demat & ASBA services and accept the terms and conditions mentioned. Step 6: Here you have to enter the details like Category and Applicant name. Once you select the Applicant name, others details like PAN, Depository, Beneficiary DP account number will be pre - populated. Now tick the checkbox for Cut Off price, enter the quantity and select the bank account where in which the money should be blocked. 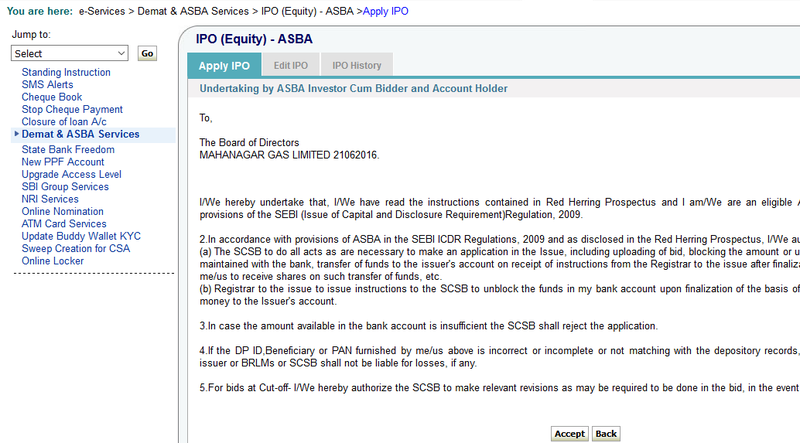 Step 8: You can verify the application status by clicking on the IPO history tab as below. Here you see that two applications are submitted for two individuals, but money is blocked from the same account. So next time, think about an IPO gift to your wife on her birthday!! !